A secret society of monsters and misfits, The Nightbreed have always been with us. New in canon stories from Midian and the world of NIGHTBREED based on the cult horror film! Explore both the past and the present of this clandestine tribe of creatures, unleashing new secrets and horrors as they fight to coexist with mankind. As Peloquin makes meat of slave owners, he will soon discover his true hatred for naturals. The only ones to trust are those made of the night. In another time, a world away, Shuna Sassi only knows a life of fear. With the death of an important senator, she is cast out from the world of prostitution and forced into the sewers. The voice of the man she has killed haunts her very soul, but will it tempt her to finally give herself the ultimate end? Before FABLES, before ONCE UPON A TIME, Clive Barker created a secret town of monsters that live among us. Don’t worry if you’ve never seen the film—Barker and writer Marc Andreyko (MANHUNTER) have crafted a story that all horror fans can enjoy. Add to the mix Piotr Kowalski’s art (MARVEL KNIGHTS: HULK) and this is a story that can’t be missed. 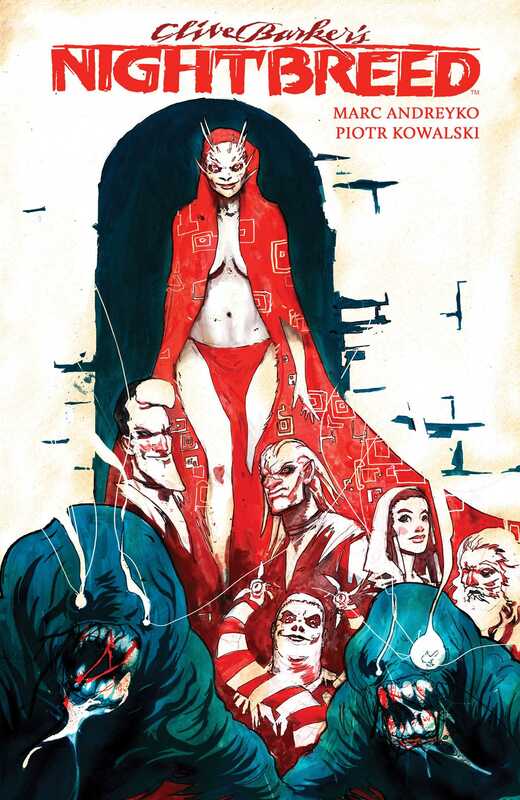 Collects NIGHTBREED #1-#4.